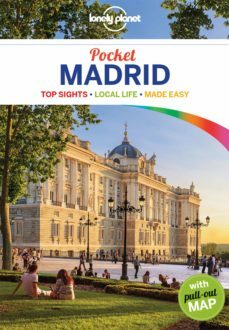 Lonely Planet: The world's leading travel guide publisher Lonely Planet Pocket Madrid is your passport to the most relevant, up-to-date advice on what to see and skip, and what hidden discoveries await you. View the marvellous frescoes at Plaza Mayor, see Picasso's Guernica at the Reina Sofia, or have a picnic in Parque del Buen Retiro; all with your trusted travel companion. Get to the heart of the best of Madrid and begin your journey now! Inside Lonely Planet Pocket Madrid: *Full-colour maps and images throughout *Highlights and itineraries help you tailor your trip to your personal needs and interests *Insider tips to save time and money and get around like a local, avoiding crowds and trouble spots *Essential info at your fingertips - hours of operation, phone numbers, websites, transit tips, prices *Honest reviews for all budgets - eating, sleeping, sight-seeing, going out, shopping, hidden gems that most guidebooks miss *Free, convenient pull-out Madrid map (included in print version), plus over 19 colour neighbourhood maps *User-friendly layout with helpful icons, and organised by neighbourhood to help you pick the best spots to spend your time *Covers Salamanca, Plaza Mayor, Royal Madrid, El Retiro, La Latina, Lavapies, Malasana, Chueca, Sol, Santa Ana, Huertas, and more The Perfect Choice: Lonely Planet Pocket Madrid a colourful, easy-to-use, and handy guide that literally fits in your pocket, provides on-the-go assistance for those seeking only the can't-miss experiences to maximise a quick trip experience. * Looking for a comprehensive guide that recommends both popular and offbeat experiences, and extensively covers all of Madrid's neighbourhoods? Check out our Lonely Planet Madrid guide. * Looking for more extensive coverage? Check out our Lonely Planet Spain guide for a comprehensive look at all the country has to offer, or Lonely Planet Discover Spain, a photo-rich guide to the country's most popular attractions. Authors: Written and researched by Lonely Planet. About Lonely Planet: Since 1973, Lonely Planet has become the world's leading travel media company with guidebooks to every destination, an award-winning website, mobile and digital travel products, and a dedicated traveller community. Lonely Planet covers must-see spots but also enables curious travellers to get off beaten paths to understand more of the culture of the places in which they find themselves.